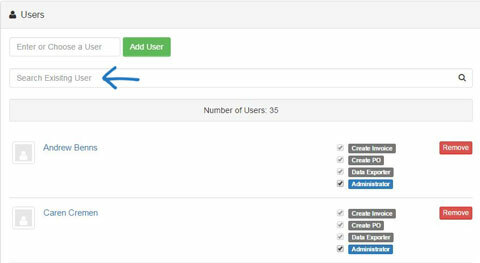 Within the Users section, administrators are able to manage their user's capabilities within ESP CRM and Orders. To locate an existing user, begin entering the user's full name in the Search Existing User box. As you type, matching results will display below the search box. Create Invoice: Enables the user to create invoices. Create PO: Enables the user to create purchase orders. Data Exporter: Enables the user to export data from ESP Orders and CRM. Administrator: Provides administrative control of ESP Orders and CRM to the user. Note: If a user has been marked as an administrator, they will automatically be designated as able to create invoices, purchase orders, and export data.